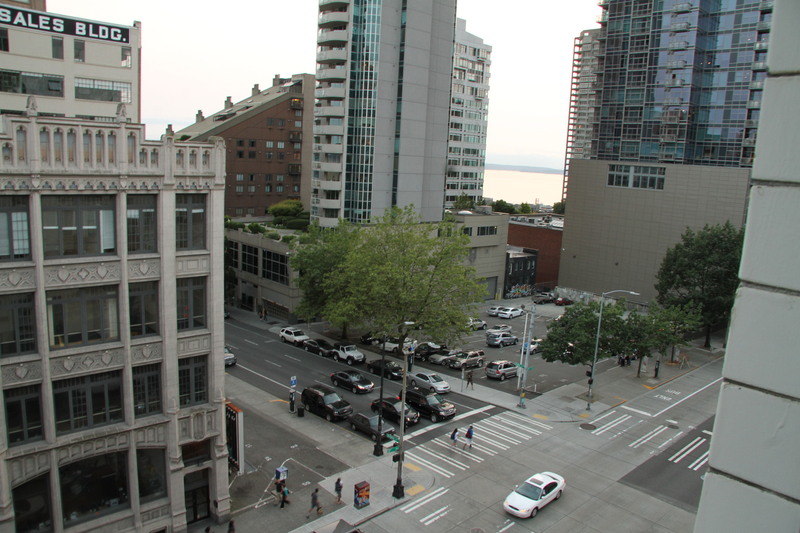 The view of the Seattle waterfront from the Moore Hotel. Friday, August 10, 2012. 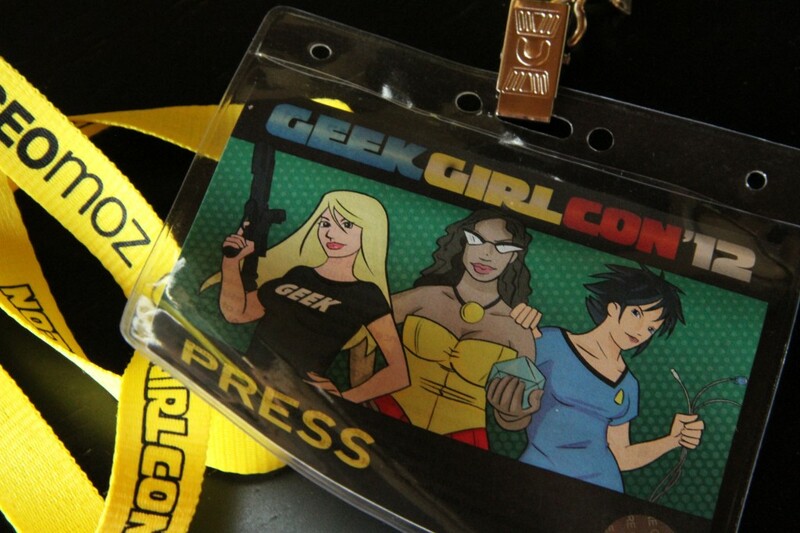 If you haven’t heard of GeekGirlCon, you’re certainly not alone. I hadn’t heard of it either until a year ago in October, when Shawn and I were in Seattle and we happened to come across a poster promoting it. Shawn, a lifelong comic nerd who knows a good story when he sees one, thought it would behoove us to stick around Seattle for the afternoon to attend the inaugural convention, but we were on our way to San Juan Island and therefore couldn’t linger. Nevertheless, GeekGirlCon was forever imprinted on our consciousness. It’s sweltering (for the west coast), and we find ourselves in Seattle yet again. This time, GeekGirlCon is our priority. The irony (going to a female-oriented convention and all) is that Shawn is the primary reason why we’re here, not me. He got us media accreditation to cover the event for his site, The Snipe News. I’m tagging along as a spectator, the flaneuse, the pseudo photographer. Mind you, I’m as geeky as the best of them. Although I don’t wear my geekiness on my sleeve, I have spent way too many hours playing Elder Scrolls Oblivion, Carl Sagan is my hero, and I sometimes like to dress up as Pris from Blade Runner. I won’t even bring up the years I spent on MUDs. So in reality, going to GeekGirlCon was a perfect fit. I felt even better attending after reading their values. 1. All geeks are welcome. Essentially, GeekGirlCon strives to be the inclusive convention that brings geeky women together. You don’t have to self-identify as a geek, nor do you have to be female, in order to attend; everyone is welcome and encouraged to come. And so we came. 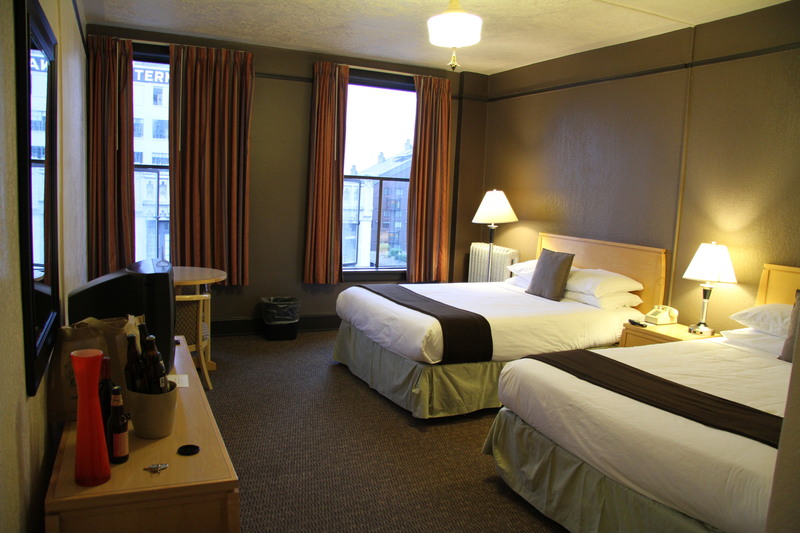 Of course, a weekend in Seattle isn’t complete without staying at the Moore Hotel. Our two queen bed room at the Moore Hotel. Friday, August 10, 2012. The Moore is a Seattle institution. It’s a heritage hotel attached to the Moore Theatre, a popular live music venue. No two rooms in the hotel are alike. 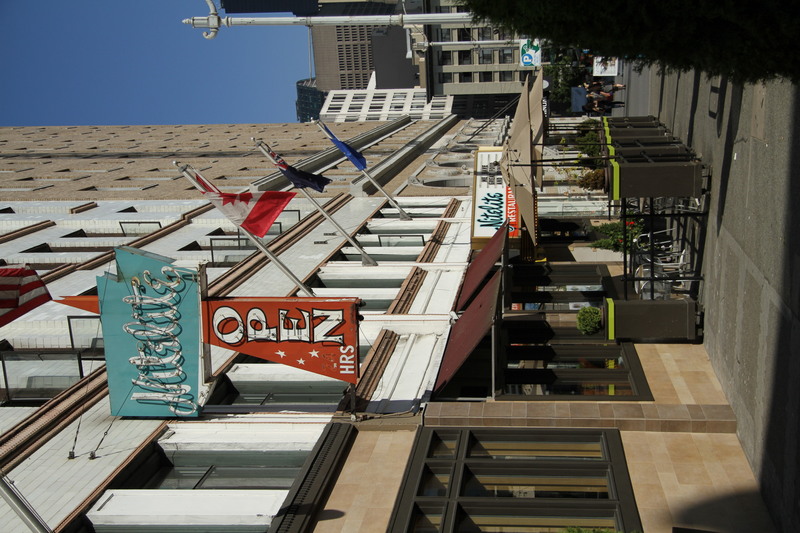 It’s located in Belltown within stumbling distance of bars, restaurants, and coffee shops. 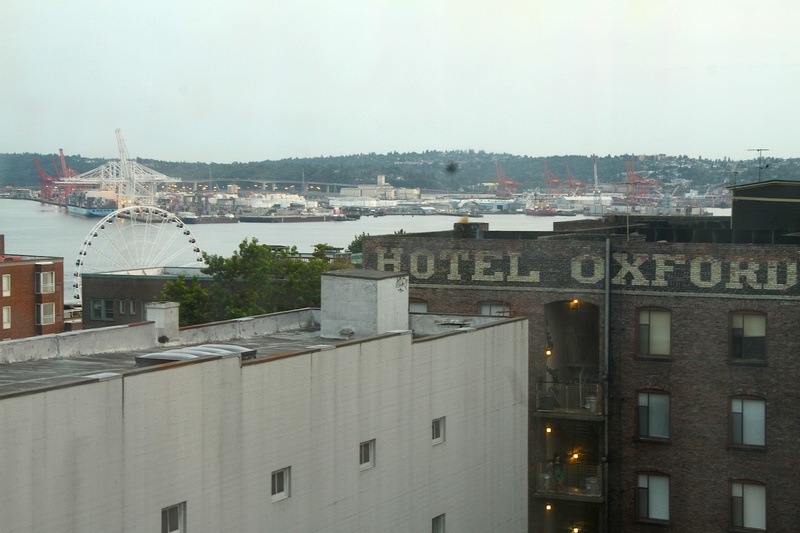 Pike Place Market is a few blocks away, Seattle Center’s near enough, and the rooms, on average, are often under $100. This is, I think, the fifth time I’ve stayed here, and to me, it’s home. Heck, the front desk staff even recognize us. Our view from the room looking down at the intersection of 2nd Avenue and Virginia. Whenever we arrive in Seattle, we normally stake out a happy hour for dinner, especially since the concept of an hourly drink special is completely illegal in BC. This time, however, we indulged in some craft beer that we picked up from the Haggen in Ferndale, before making our way down 1st Avenue in seek of food. We ended up, quite happily, at Bisato. Neither of us had heard of Bisato, a Venetian-inspired open kitchen restaurant that offers gourmet tasting plates in a casual setting. But we caught sight of the restaurant’s menu as we walked by and we liked what we saw. What sealed the deal was when a couple stumbled out, passionately boasting to us about the food they just consumed. They were regulars to the restaurant. When asked what we should try, they started to list off one dish after the other until they concluded that EVERYTHING was good. So it was here at Bisato where where we feasted on figs stuffed with chicken liver pate (the couple’s recommendation), warm prawns with fava bean salad, polenta with meat ragu and fonduta cheese sauce, homemade folded pasta with octopus puttanesca (WOW! ), and a lemon tart dessert. The food was exquisite and we savoured every bite. And it was at the bar, upon sipping my Sotto Voce cocktail (Nardini grappa, Lillet, lemon juice, egg whites) that I realized they must have one of the largest selections of grappa in, well, probably many a place. While I’m not too familiar with grappa, I knew it was made by distilling grape seeds/skins – the byproduct after grapes are pressed for wine. When we inquired further about the grappa to our server, he mentioned that the owner likes to collect grappa wherever he goes. So for grappa fans heading to Seattle? You know where to go. Completely satisfied with our meal at Bisato, we wandered back to our hotel. Although we had planned a quiet night, we decided we’d go for a nightcap at the Nitelite Lounge. The Nitelite Lounge the following afternoon. Saturday, August 11, 2012. 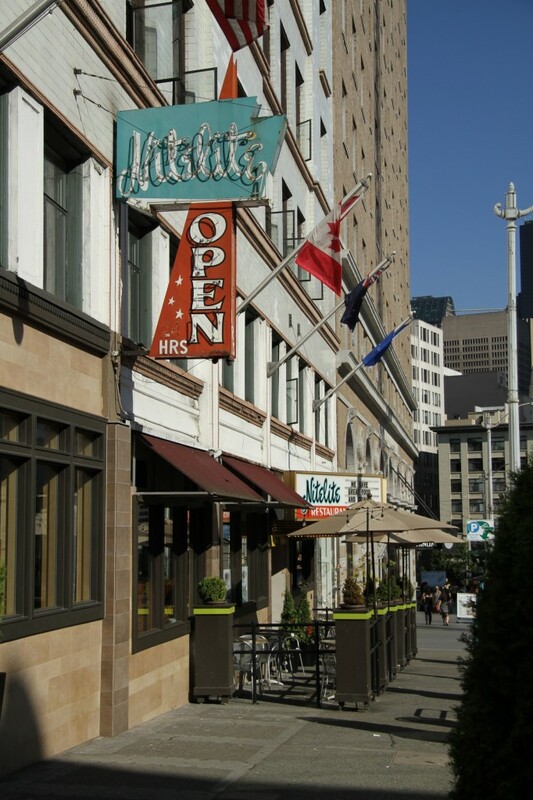 The Nitelite’s conveniently located in the same building as the Moore Hotel. It’s a dive bar with pool tables and a juke box and they stay open until 2am. The last time we ventured there was during the Bumbershoot music fest weekend in 2011. A wedding party had dropped off a box of leftover cupcakes for anyone to indulge, and Jaegermeister shots were being passed around like candy. A musician friend of ours introduced us to Kevin and Lisa who were also Canadian, also in town for Bumbershoot. Kevin hogged the juke box that night, and we were annoyed that we never got a chance to hear our songs, despite dropping a bunch of quarters. That jerk! Of course, it was the morning after when I clued in that Kevin was Kevin Drew of Broken Social Scene fame. The Nitelite is that kind of place. This time around we sat right at the bar and ordered some bourbon – a generous pour – scandalous back home, two of them for less than $12. We ended up sitting next to a transplanted Chicagoan who grew up watching the CBC, reminiscing about Mr. Dressup and The Friendly Giant. While watching the Olympics, we debated the politics of Oscar Pistorious and got on a wonderful array of cross border tangents. We must have chatted at the bar for hours, consuming bourbon in ways that you can only do in Seattle. Perhaps this wasn’t the smartest move on the eve of the first day of GeekGirlCon, but it seemed like a good idea at the time. Love the Nitelite! What a weird little bar. Good jukebox, too.